The 2011 special collector's edition, Silver & Gold is available for immediate shipment! Articles Include: A Cannon Full Of Silver And Gold! ; Silver & Gold In The Land Of Enchantment; Silver – The New Gold; Who Hid The Silver And Gold? ; Testing The Fisher Gold Bug Pro; A Boulder Of Gold! 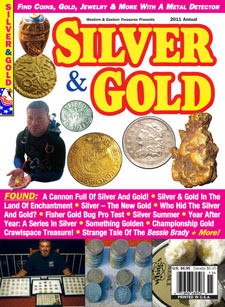 ; A Silver Summer; My Past Is Five Hours Ahead; Something Golden; Maybe She Lost Her Toes To Frostbite; Championship Gold; Year After Year: A Series In Silver; Crawlspace Treasure! ; The Strange Tale Of The Bessie Brady; Much More!